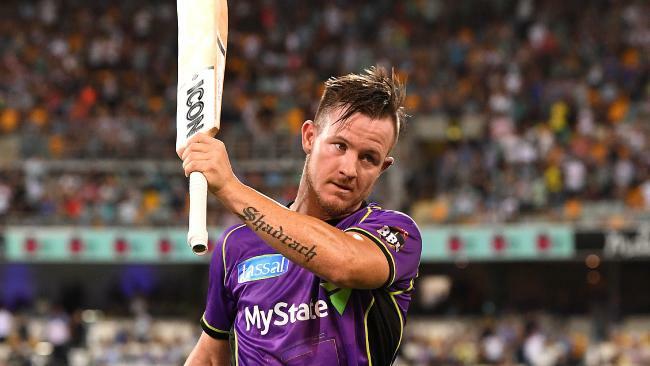 D'Arcy Short shattered BBL records. AFTER six and a half weeks, 40 matches and a truckload of sixes, the Big Bash League finals are upon us. Ahead of Thursday's first semi-final between the Perth Scorchers and Hobart Hurricanes, we pick our team of the season. Short set a record for the most runs in a season and did it at a rapid clip as well. 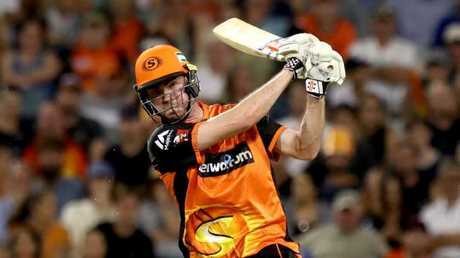 He also posted the single biggest score in BBL history by hammering an unbeaten 122 against Brisbane. His form in early January was out of this world (97, 96, 42, 122* 59). Alex Carey enjoyed a breakout season in the BBL. 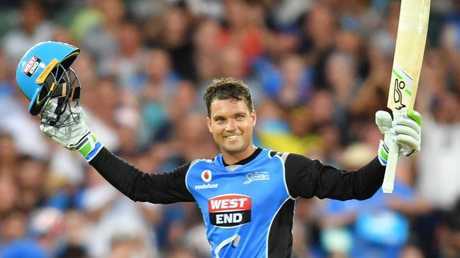 Any other year the Strikers keeper would have been the story of the season, with his 425 runs second only to Short's 504 for the most in a BBL campaign. 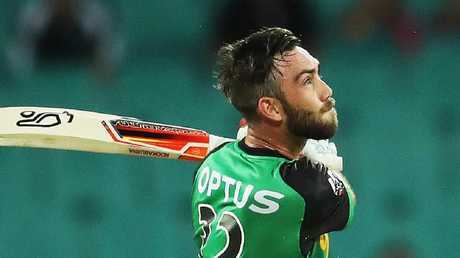 Did his burgeoning reputation behind the stumps no harm and played one of the season's most destructive innings against Hobart, hammering 100 off 56 balls. Cameron White averaged 100 this season. Seven matches. 302 runs at 100.66. Strike rate of 112.26. Just edges Shane Watson out for a spot in our XI, having scored only 29 fewer runs off three fewer games. His strike rate was on the lower end of the scale but the veteran was a rock at No. 3, allowing the rest of the Renegades batting order to express themselves. He scored three half-centuries in seven innings and each of them was important. Glenn Maxwell was the silver lining on a terrible season for the Melbourne Stars. Maxwell was the one thing that went right for wooden spooners Melbourne Stars. The fifth highest run-scorer for the tournament, the 29-year-old was among the competition's most consistently destructive batsmen. Cooper was the fire to White's ice for the Renegades, tasked with going hard from ball one. An average of 43.66 and a strike rate of 143.95 suggest it was a job he was up to. Took one of the catches of the season to seal his spot in our XI. Ashton Turner scored quicker than anyone in BBL 07. 10 matches. 250 runs at 35.71. Strike rate of 165.66 . 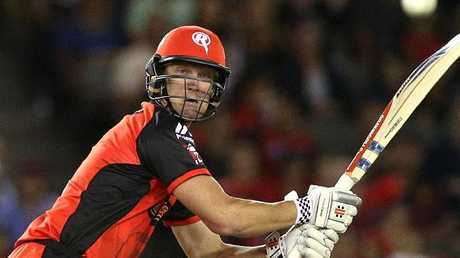 Turner proved himself the man for the chase early in the season when he blasted an unbeaten 52 off 27 against the Sydney Sixers. It was the first of many similarly destructive performances. Short may have dominated the headlines with his record season, but Turner was every bit as impressive, finishing with the highest strike rate of anyone who scored more than 100 runs in the season. Ashton Agar had a season to remember with the ball. Agar was a reliable performer batting at the death for the Scorchers, but it's what he did with the ball that won him a spot in our XI. The tall left-arm finger-spinner was virtually unhittable all season, going for less than a run-a-ball and regularly chipping in with wickets. The 22-year-old quick was among the competition's most exciting players, producing highlights both as a bowler and a fielder. Archer was arguably the most complete quick in the competition, taking wickets with the new ball and keeping the runs down with the old. 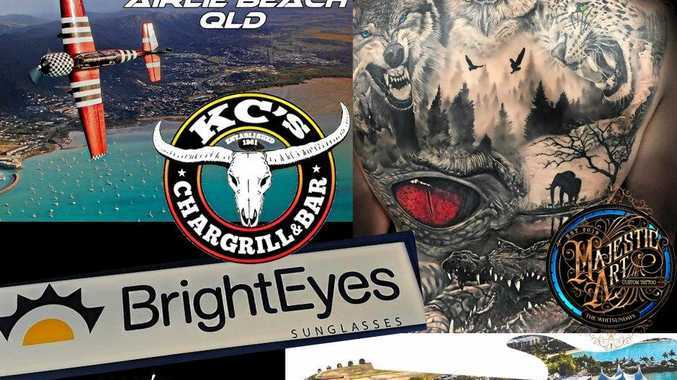 Unsurprisingly, the Hurricanes have signed him up for two more seasons. Andrew Tye took 16 wickets in only six matches. 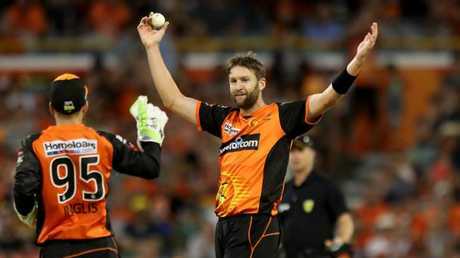 Tye only played six games for the Scorchers before being whizzed away for Australia duty but still finished third on the wicket-taking list. The highlight of his season was of course his hat-trick against the Sydney Sixers. Bowler of the tournament, the season's best import and possibly BBL 07's finest performer; Rashid Khan was equal parts unplayable and unhittable, topping the wicket-taking charts and finishing with the best economy of anyone who bowled more than a single over. Fawad Ahmed was the Thunder’s best player this year. 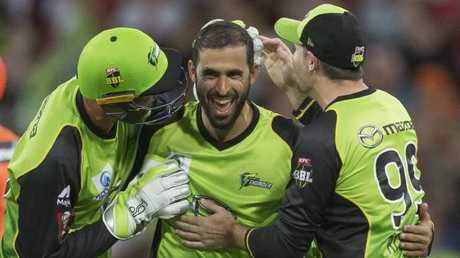 Despite the Sydney Thunder again missing out on the finals, Fawad Ahmed enjoyed an outstanding two months. The leg-spinner took a wicket in all but two of the games he played and leaked just over a run-a-ball.